Do you have a few hundred dollars and want to find a good stock to buy? Our team of Fools thinks these three stocks are great choices. Trading commissions have plunged over the past few decades, making it cost-effective to buy or sell individual stocks even if you don't have thousands of dollars to invest. Knowing that, we asked a team of Foolish contributors to share a stock they think is a great buy right now for an investor who has $500 lying around. Read on to see why they believe FactSet Research Systems (NYSE:FDS), GoPro (NASDAQ:GPRO), and Clean Energy Fuels Corp. (NASDAQ:CLNE), are great choices. Brian Feroldi (FactSet Research Systems): I'm a huge fan of investing in companies that have recurring revenue business models and plenty of room for growth ahead, which is why I think FactSet Research Systems is a great stock for investors of all ages to consider buying today. FactSet makes its money by aggregating financial data from hundreds of sources and then it selling it to a diverse group of financial companies. Banks, mutual funds, hedge funds, insurance providers, and more have all signed on as customers to get their hands on the company's massive trove of data. As of the end of the second quarter, FactSet counted 3,100 total clients and more than 65,700 users on its platform, which demonstrates just how broadly diversified its customer base is. Better still, the company's retention rate stood at 95%, which shows just how much value customers get from its platform. What's wonderful about this business model is that FactSet's customers become heavily reliant on the company's data to help them run their business, so they happily sign long-term contracts that include annual price increases. Those contracts provide FactSet with tremendous revenue visibility, which allowed its revenue and profit to grow right through the teeth of the financial crisis. 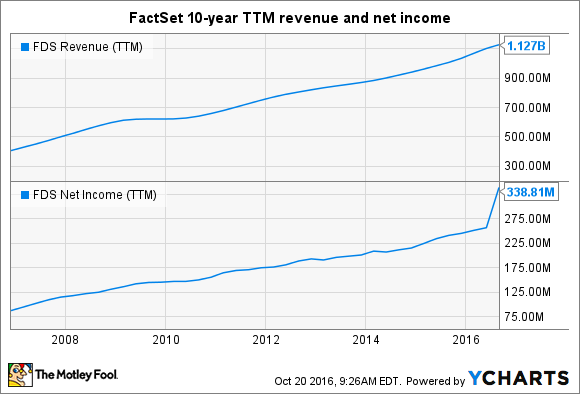 Between market-share gains, annual price increases, and international expansion, FactSet should have no problem growing revenue and profit at above-average rates for years to come. These factors have turned me into a happy shareholder, so if you've got $500 to invest, I highly recommend you give FactSet a closer look. Steve Symington (GoPro): For investors putting a relatively small amount of money to work and comfortable with taking some risk, I think the potential reward of buying shares of GoPro right now is just too compelling to pass up. The action-camera specialist just became so much more on Oct. 23, when its new Karma drone finally arrived on store shelves. This marks GoPro's widely anticipated entry into consumer drones, a market some analysts expect to enjoy compound annual growth of more than 30% over the next eight years. GoPro also formally launched two new high-end HERO 5 cameras earlier this month, fulfilling a badly needed refresh of its aging capture-device lineup in time for the lucrative holiday season. And even though GoPro opted to aggressively price those cameras, notably by offering the high-end, waterproof, cloud-connected HERO 5 Black model for $399 -- the same price as its best-selling middle-of-the-road HERO 4 Silver before -- management has already indicated that the move shouldn't come at the expense of margins. Then again, I wouldn't blame investors who would rather wait for more clarity on consumers' early reception of these products. And GoPro will almost certainly offer details to that end with its forward guidance when it releases third-quarter 2016 results on Nov. 3. But if there's any inkling that GoPro's new products have helped it jump back on the path back to sustained, profitable growth, I suspect that today's patient shareholders will be happy they bought GoPro early and held on. Jason Hall (Clean Energy Fuels Corp.): I've followed natural gas for transportation leader Clean Energy Fuels Corp. for years. And while the company has been a relatively high-risk investment -- and a pretty terrible one at times -- for several years, I've watched the quality of the business steadily improve. Over the past year, Clean Energy has made big strides toward steady profitability. The company paid down nearly 30% of its long-term debt earlier this year, has steadily lowered its operating expenses, and turned in several profitable quarters this year. At the same time, the company is approaching an all-important metric -- becoming cash-flow positive. In other words, Clean Energy Fuels has essentially reached a point where its cash flow should cover all of its expenses, including funding its capital expansion needs over the next several years. The big question? Will medium- and heavy-duty vehicle fleet operators start adopting natural gas vehicles at a higher clip in coming years? The company has managed to steadily grow fuel sales even through the oil downturn that kept diesel prices low and hurt the competitive advantage at the pump for natural gas. If that does happen, Clean Energy could make for an excellent investment, both in the near term and the long term. If you're willing to take on a little risk, $500 in Clean Energy Fuels shares may be exactly what you want.